History may one day rule this was the fateful geopolitical moment when the European Union clinched its PhD on foreign policy. Last week, EU foreign policy head Federica Mogherini and Iranian Foreign Minister Mohammad Javad Zarif, announced at the UN a “special purpose vehicle” (SPV) to deal with the Trump administration’s sanctions on Iran after the US unilaterally pulled out of the JCPOA, also known as the Iran nuclear deal. The SPV, which according to Mogherini “is aimed at keeping trade with Tehran flowing while the US sanctions are in place,” could be in effect before the second stage of US sanctions begin in early November. This single initiative means Brussels is attempting to position itself as a serious geopolitical player, openly defying the US and essentially nullifying the Iran demonization campaign launched by the White House, CIA and State Department. It’s not enough to remember that the JCPOA is a UN-endorsed multilateral deal achieved after years of painstaking negotiations. 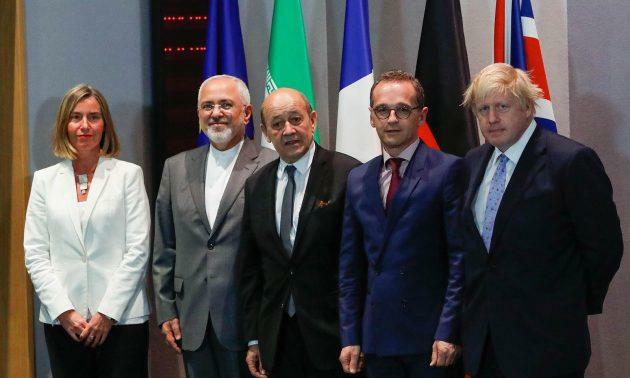 The other JCPOA signatories apart from Iran and the US – Russia, China and the EU-3 (France, Britain and Germany) – have always been adamant to keep the deal going while supporting Iran on the civilian nuclear energy field. It may have taken a few months, but the EU-3 have finally realized what Moscow and Beijing already knew: any business with Iran – which is in the interest of all players – must bypass the US dollar. So now we come to a situation where the EU-3 will set up a multinational, state-backed, financial mechanism to help European companies conduct business with Iran in euros – and thus away from US financial enforcers. In parallel, we will have Russia and China doing business with Iran in rubles and yuan. Savvy energy traders knew that BRICS members Moscow and Beijing would continue to do oil and gas business with Tehran. BRICS member India, though, folded under American pressure. The SPV will allow Iran to keep at least the 40% of its oil exports that go to the EU market in place and even allow investments by EU energy giants on Iranian infrastructure. It also opens an escape route for easily frightened energy customers such as India. And in a total symbiotic way, the SPV opens another path for Russia and China as well. After all, the SPV mechanism will bypass the Belgium-based SWIFT financial network, on which the US interferes at will. SPV may become the preferred post-SWIFT mechanism, allowing for even more cross-border business across Eurasia and expanding to the Global South. On the other hand, US national security adviser John Bolton – not exactly a popular figure in Brussels – has vowed to keep imposing “maximum pressure” on Tehran, and is threatening the EU if the SPV is implemented. For Brussels, preservation of the JCPOA is sacrosanct. It’s directly linked to the credibility of Brussels institutions that are always under siege. If they buckle, a potential disaster in the coming European parliamentary elections in May 2019 will become a certainty. The game reveals its complexity when we consider that Iran has been the catalyst for the EU to finally stand up to the US – and potentially get closer to Russia and China. What we see emerging is the contours of a possible cross-Eurasia alliance, in multiple fronts, between Russia-China-Iran – the three key nodes of Eurasia integration – and the EU-3. It’s a game worthy of a Persian chess master: involving energy wars, the balance of power in Southwest Asia, the absolute power of the US-controlled global financial system and the status of the US dollar – bolstered by the petrodollar – as the global reserve currency. All these themes had been lurking in the EU corridors in Brussels for years – with commissioners and diplomats pressing for a more forceful euro in global trade (much as in Beijing in relation to the yuan). Arguably, a concerted offensive spearheaded by the SPV will lead the euro, the yuan and the ruble to eventually establish themselves as credible reserve currencies. Dollar weaponization, beware.